There are two naturally occurring NMR active nuclei of Boron, 11B (80.1%) and 10B (19.9%). Both nuclei are quadrupolar with spin of greater than ½. 11B has a spin of 3/2 and 10B is spin 3. In terms of sensitivity, 11B is the better nucleus to use as it has a higher natural abundance, a higher gyromagnetic ration, and a lower quadrupole moment. 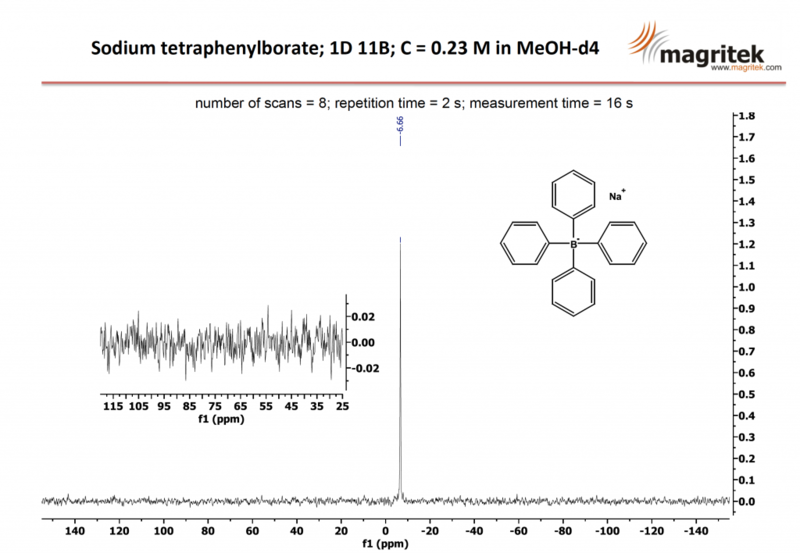 A Spinsolve benchtop NMR spectrometer with a proton frequency of 60 MHz can be configured to measure the 11B NMR signal which has a frequency of 19.2 MHz. 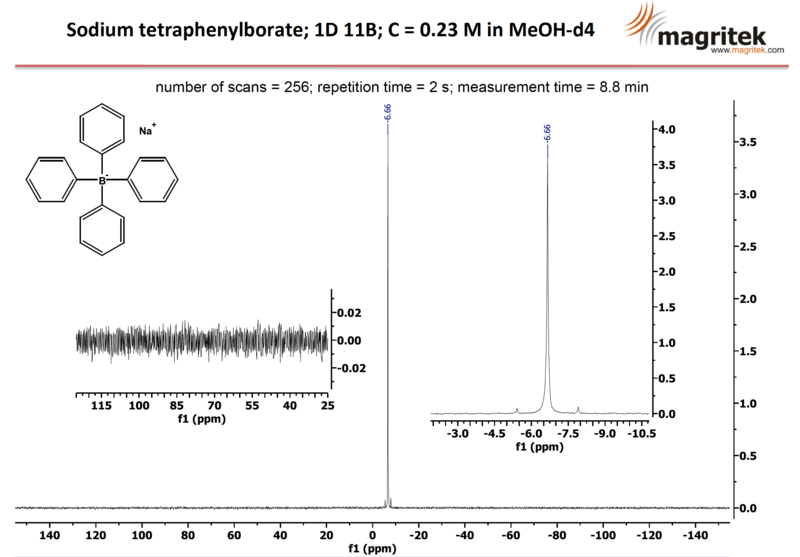 The 11B NMR spectrum of a 0.23 M solution Sodium tertraphenylborate in MeOH-d4 is shown below. The first spectrum shows the excellent sensitivity of Spinsolve using just 8 scans to acquire a spectrum in only 16 seconds. By increasing the number of scans to 256, the measurement time is increased to 8.8 minutes, but now the exceptional sensitivity reveals the carbon-13 satellites either side of the boron line. In this image we expand both the noise and the signal in separate insets to enable you to see the remarkable sensitivity achievable with the Spinsolve benchtop NMR spectrometer. 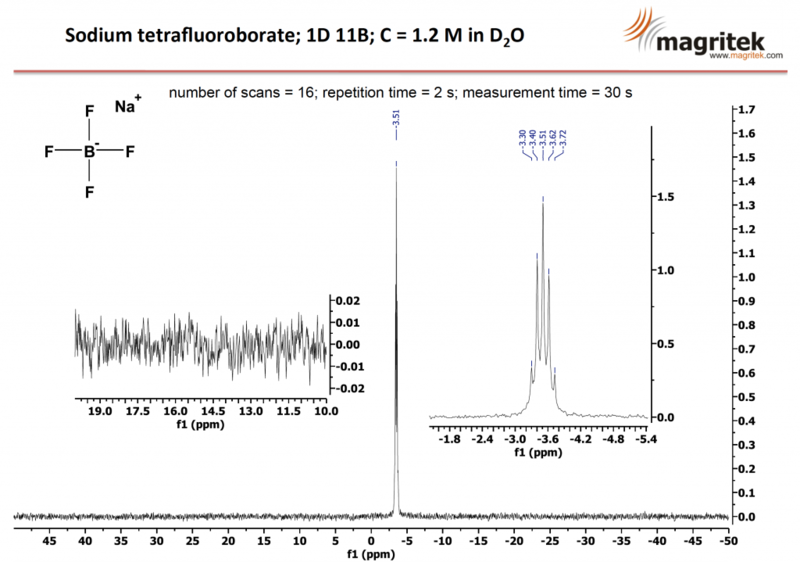 We measured a second sample of 1.2M Sodium tetrafluoroborate in D2O. 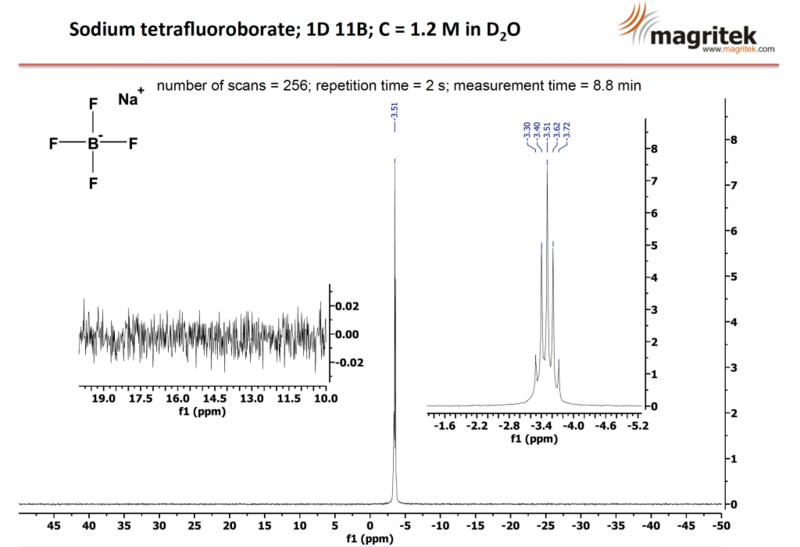 A 30 second, 16 scan acquisition is shown below revealing a quintuplet multiplet resulting from the 4 attached Fluorine atoms. Increasing the number of scans to 256, a total experiment time of 8.8 minutes, shows a very clean spectrum with excellent sensitivity and low noise.